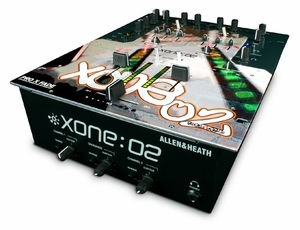 Stereo pro-turntablist DJ mixer From inputs to outputs, we created Xone:02 to be the worlds greatest battle / scratch mixer. The crossfader is a deluxe Penny & Giles VCA design, reversible, they all have contour controls and they can all be easily replaced by removing the steel faceplate. Weve kept the fader area clear for action and weve kept controls like pan and EQ out of the way on low profile sliders. Even the transform switches can be rotated to work the way you like them. Dont go into battle with anything less. An ultra-high quality Penny & Giles conductive plastic crossfader comes fitted as standard on the Xone:02. Replacement of crossfaders is easy - it takes only minutes to remove the faceplate and replace the fader unit.